Oregon 99 follows the route of Old U.S. 99, mostly following Interstate 5 between Ashland near Siskiyou Summit and Eugene. North of Eugene, Oregon 99 divides into Oregon 99W and Oregon 99E in Junction City, with Oregon 99W passing through Corvallis and McMinnville and Oregon 99E serving Albany and Salem. The two routes unify (more or less) in Portland at the foot of the Interstate Bridge over the Columbia River, although significant segments of both Oregon 99E and 99W have been decommissioned and shifted to city maintenance. U.S. 99, the Pacific Highway, was the main north-south route between northern California, western Oregon, and western Washington. U.S. 99 served the cities of Ashland, Medford, Grants Pass, Roseburg, Eugene-Springfield, Albany, Salem, and the greater Portland metropolitan area. The completion of Interstate 5 signaled the end of the road for U.S. 99, and in 1971 the federal highway was decommissioned and renumbered Oregon 99. Most of the routing of original U.S. 99 was retained as Oregon 99. However several segments bypassed by Interstate 5 were turned over to county maintenance. Oregon 99 overlaps off and on with Interstate 5 from Ashland north to the Columbia River. In the city of Eugene, U.S. 99 once shared pavement with U.S. 126. The two highways overlapped along Franklin Boulevard west to Broadway, Mill Street, and the one-way street couplet of 6th & 7th Avenues. U.S. 126 was relocated to a freeway in 1971 and decommissioned in 1972 as Oregon 126. Oregon 126 Business saw commissioning along the former surface street alignment through both downtown Eugene and Springfield. Oregon 99 & 126 Business maintain an overlap as their predecessors did from Interstate 105 east to Interstate 5. Northbound Oregon 99 (signed as a business route) approaches the Rock Point Bridge, which crosses over the Rogue River in southern Oregon. Photo taken 05/28/06. Oregon 99 (Sams Valley Highway) turns onto the Rock Point Bridge at Rock Point west of Gold Hill in southwestern Oregon. The former U.S. 99 spans the Rogue River itself between the Sams Valley Highway and Rogue River Highway. Interstate 5 parallels the state highway closely along the south banks of the river. Photo taken 03/31/05. U.S. 99 shield posted along Oregon 99 (Rogue River Highway) southbound on the approach to the Exit 43 access road to Interstate 5. Oregon 99 crosses the Rock Point Bridge and meets Interstate 5 via a diamond interchange nearby. The junction shield pictured here indicates that Oregon 99 departs Interstate 5 for the Rogue River Highway. A companion shield assembly across the street references Oregon 99 Business, but signs along the freeway do not mention a business route. Either way it's a great find considering that U.S. 99 was decommissioned statewide in 1971! Photos taken 03/31/05. Even after signs were replaced in this vicinity in 2006, the U.S. 99 shield remained in place a year later. Photos taken 05/28/06. Shield and guide sign assembly posted on Oregon 99 (Rogue River Highway) southbound at the Exit 43 access road to Interstate 5. Both highways straddle the Rogue River west five miles to the city of Rogue River. Note the changes to this sign and shield assembly between 2005 and 2006. And yet the U.S. 99 shield remains! Photo taken 03/31/05. Second photo taken 05/28/06. The shield assembly posted at the Exit 43 access road end at Oregon 99 (Rogue River Highway) reveals no business loop for Gold Hill and an overlap with Oregon 234. Oregon 99 remains along the original U.S. 99 alignment town. Oregon 234 begins at the 2nd Avenue intersection with 4th Street in Gold Hill to the east. Photo taken 03/31/05. Oregon 99 north & 126 Business west follow Broadway west from Franklin Boulevard into the central business district of Eugene. The tandem turn northward onto Mill Street at the split with Broadway ahead of the ramp onto Coburg Road north. Broadway enters downtown Eugene to the west while Coburg Road elevates to cross the Willamette River ahead of the Exit 2 interchange with Interstate 105 & Oregon 126. Photo taken 04/01/05. Oregon 99 & 126 Business turn west from Mill Street onto the one-way street couplet of 6th & 7th Avenues. Coburg Road heads northeast from Mill Street along a viaduct over the Union Pacific Railroad, 4th Avenue, and the Willamette River. A truss bridge carries drivers northeast to the Autzen Stadium area at the Coburg Road intersection with Martin Luther King Jr. Boulevard and Country Club Road. Oregon 99 north & 126 Business west meanwhile intersect High Street at the southbound off-ramp from Coburg Road to 6th Avenue. High Street flows north to the 5th Street Public Market and Skinner Butte Park along the river front. Photo taken 04/01/05. Reassurance markers for Oregon 99 north & 126 Business west posted on the 6th Avenue block between High and Pearl Streets. Photo taken 04/01/05. Westbound 6th Avenue at the intersection with Pearl Street. Pearl Street leads south 1.1 miles to 20th Avenue at the Eugene Civic Stadium. Amazon Parkway stems south from there to 30th Avenue in south Eugene. Photo taken 04/01/05. Oregon 99 north & 126 Business west at the intersection with Olive Street, one quarter from Interstate 105. Photo taken 04/01/05. A second guide sign for Interstate 105 eastbound resides at the 6th Avenue westbound intersection with Charnelton Street. Interstate 105 & Oregon 126 cross the river and meet the Delta Highway near Valley River Center mall. Delta Highway joins Interstate 105 with Belt Line Highway, an east-west freeway that serves the Eugene suburb of Santa Clara. Photo taken 04/01/05. Approaching the intersection with Lincoln Street and northbound on-ramp to Interstate 105 & Oregon 126 on 6th Avenue west. Photo taken 04/01/05. Oregon 126 eastbound joins Interstate 105 to cross the Jefferson-Washington Street Bridge over the Willamette River. The 6th Avenue off-ramp to the Eugene freeway network leaves from the Lawrence Street intersection. Photo taken 04/01/05. Oregon 99 north & 126 Business travel underneath the ramps to 7th Avenue from Interstate 105 & Oregon 126. Attached to the northbound ramp from Washington Street is a button copy pull-through panel for Oregon 99, likely installed from the time of U.S. 99's decommissioning in 1971. Oregon 126 Business ends at the Oregon 126 westbound merge from Interstate 105 ahead. Photo taken 04/01/05. 7th Avenue continues east from the Interstate 105 & Oregon 126 freeway ramp to Washington Street. Oregon 126 Business begins and follows Oregon 99 southbound through downtown Eugene to the University of Oregon campus. Photo taken 04/01/05. Oregon 99 south & 126 Business east turn from 7th Avenue onto Mill Street at the Coburg Road viaduct. Coburg Road stems northeast from the downtown area across the Willamette River to Martin Luther King Jr. Boulevard and Interstate 105 & Oregon 126. Photo taken 04/01/05. Traffic from Coburg Road southbound merges onto Oregon 99 south & 126 Business east (Mill Street) ahead of the merge with Broadway. A turn-off provides access to Broadway west for downtown Eugene. Photo taken 04/01/05. A set of mast-arm supported signals govern the movements between Mill Street south and Broadway East. Oregon 99 & 126 Business follow Broadway east to the University of Oregon campus and Franklin Boulevard. Photo taken 04/01/05. Broadway constitutes a six-lane boulevard east from Mill Street. Pictured here is the scene ahead at Ferry Street. Photo taken 04/01/05. A close look at an Oregon 99 south & 126 Business eastbound reassurance assembly posted between Ferry and Patterson Streets. Broadway name changes to Franklin Boulevard at the U. of O. campus en route to Interstate 5 south near the Judkins section of east Eugene. Photo taken 04/01/05. Oregon 99 (Rogue River Highway) southbound at the Exit 43 access road to Interstate 5 near Rock Point. Exit 43 of the freeway provides access to Oregon 234 north, an Oregon Scenic Byway leading to Crater Lake National Park. Oregon 99 meets the southern terminus of Oregon 234 (4th Street) via 2nd Avenue in downtown Gold Hill ahead. Photo taken 03/31/05. Interstate 5 and Oregon 99 straddle the banks of the Rogue River east from Grants Pass to Gold Hill. Pictured here is an interesting shield assembly featuring Oregon 99 Business & 234 Business. Oregon 99 however has no business route as it follows original U.S. 99 through Gold Hill parallel to Interstate 5. Additionally Oregon 234 does not begin until its intersection with 2nd Avenue in town. Photo taken 03/31/05. The Rock Point Bridge over the Rogue River comes into view shortly after the shield assembly. Photos taken 05/28/06. Oregon 99 turns north and crosses the Rock Point Bridge over the Rogue River near the Exit 43 diamond interchange of Interstate 5. 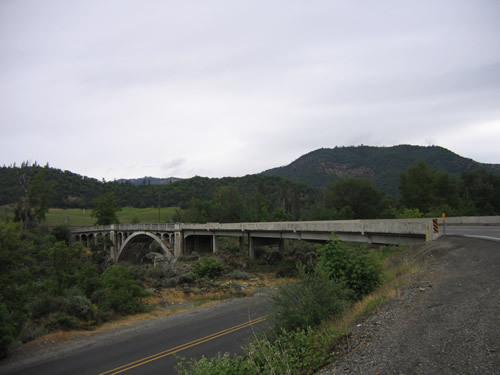 Named after the Rock Point post office nearby, the concrete arch span joins the Rogue River Highway with North River Road west and Sams Valley Highway east. Photos taken 05/28/06. Oregon 99 travels alongside the Southern Pacific Railroad through rural areas east of the Rock Point Bridge to Gold Hill. Pictured here is the North River Road intersection with Oregon 99 (Rock Point Bridge). Photo taken 03/31/05. Known also as the Old Pacific Highway Bridge, the Rock Point Bridge spans the Rogue River at Rock Point west of Gold Hill in southern Oregon. The concrete arch span replaced a tolled 1859-covered bridge. Operated by the Rock Point Bridge Company, the span was later purchased by Jackson County and made into a free crossing. The present Rock Point Bridge opened to traffic in 1920. See Structurae [en]: Rock Point Bridge (1920) for additional details. This suite of photos shows the Rock Creek Bridge from both banks of the Rogue River. The bridge carries Oregon 99 across the Rogue River between North River Road / Sams Valley Highway and Rogue River Highway west of Gold Run. The Rogue River flows south from Diamond Lake in the Cascade Range to Gold Hill, Rogue River, Grants Pass, and the Pacific Ocean at Gold Beach. Rocky banks encompass the waterway underneath the scenic arch bridge at Rock Point. Photos taken 03/31/05. Looking west at the Rogue River from the Rock Point Bridge area. The river was designated a Wild and Scenic River by Congress. Photo taken 03/31/05. 05/28/06 by AARoads and Joel Windmiller.